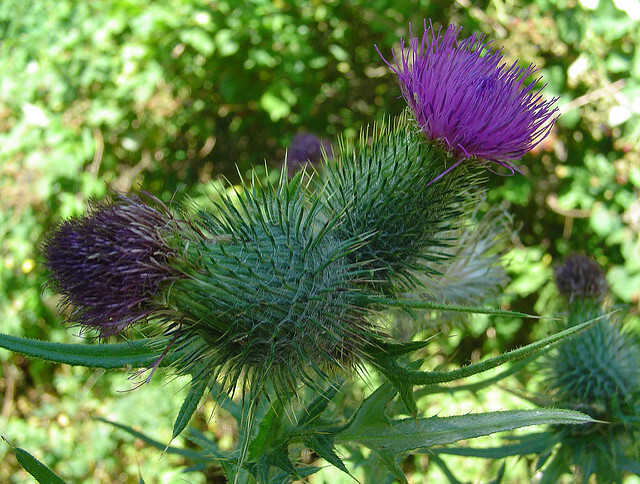 Contrary to the name, Canada thistle did not come into the U.S. from our northern neighbor, but rather was introduced in the 17th century from the Mediterranean region and southeast Europe. Roots can branch out to 15 ft. wide and deep. Canada thistle is an herbaceous perennial in the aster family with erect stems, prickly leaves, and an extensive creeping rootstock. Canada thistle is found in open areas with a moderate amount of moisture but does poorly on wet soils lacking sufficient oxygen. It can grow on many different soil types but it does not grow well in shade and is rarely found within wooded sites, except in clearings. It is commonly found in abandoned fields or lots, abandoned gravel pits, pastures, right-of-ways, roadsides, railway embankments, lawns, gardens, and agricultural fields. It also invades wet areas with fluctuating water levels such as stream banks or irrigation ditches and sloughs.